Ever wanted to have a super bedroom to amaze someone? 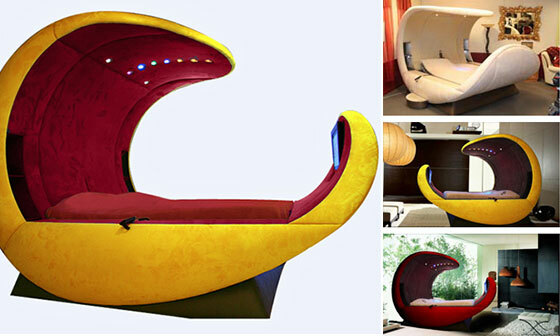 If you need a little inspirational help for this task here is a collection of 14 Unique and Exotic Bed Designs – luxurious, high-tech, fairy tale modern or abnormal. They might not be the most comfortable design, but they are truly special. Get curious? Now, let’s begin. Joseph created this elegant royal looking bed for “Formations” collection” and the idea was to provide a natural environment in chamber carved from wooden and as he dreamed, the bed looks glamorous with those marvelous artistic carvings. 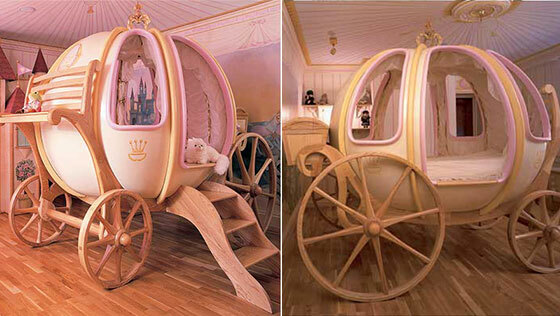 This fanciful coach bed is the most extraordinary children’s bed we’ve ever seen. Handcrafted in England of wood and fiberglass, the oval shaped interior measures just over 6 ft. in diameter. Construction and delivery time on this piece is over 6 months. The bar is set with this magnificent piece; it simply has no equal outside of fairy tales. Linens and interior options priced upon request. 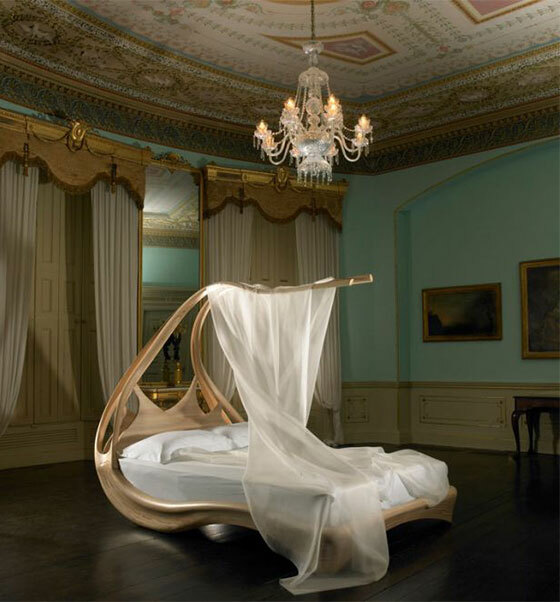 Blended with some elements of traditional four- poster beds, Cosmovoide is an example of French craftsmanship and the contemporary egg shaped bed has two mattresses which fits to the body posture for custom fit. Along with comfort, it includes home theater, an integrated TV just in front of your eyes when you lay down, telephone, and LED lights just above the head. 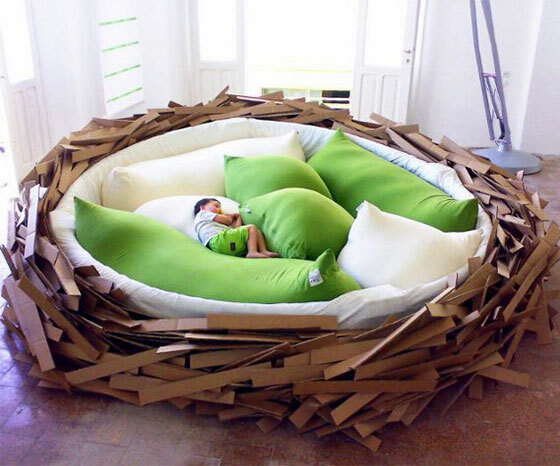 Round in shape and created as an compliment to the meticulous flying architects of nature, The Bird’s Nest is designed in 3 different sizes with largest measuring 14.8 feet in diameter. 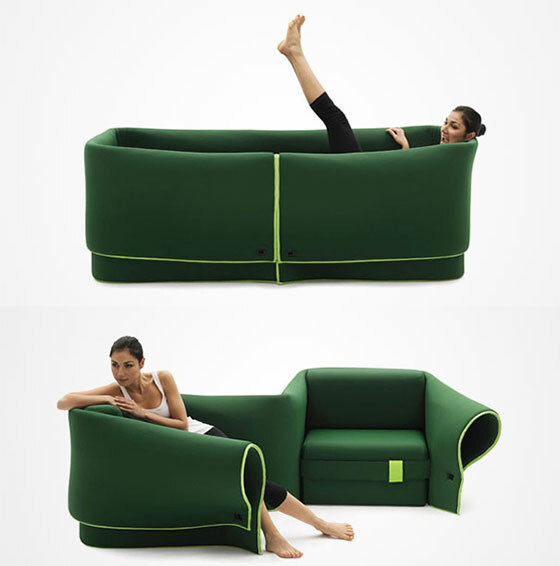 Plush pillows helps you adjust vertical and horizontal positions and can provide space up to 16 people. Private cloud looks like a giant rocking chair, or to be more exact like a rocking bed. 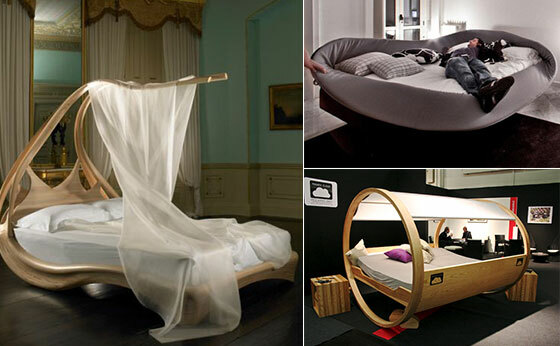 Private cloud is not a normal bed, is something that wants to revolutionize every bedroom. The bed requires a little more space than a “normal” bed but I’m pretty sure that this bed can offer new experiences to any couple. 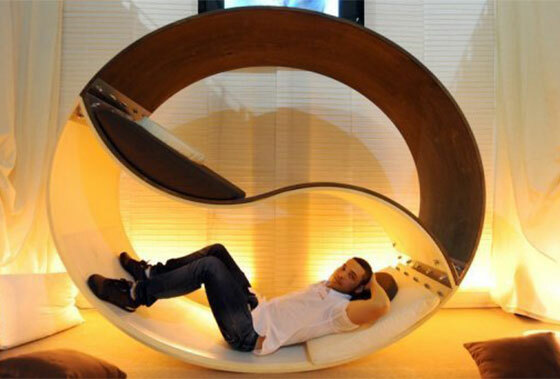 Creative bunk bed created by Italian designer Alessio Pappa. Honestly, it doesn’t look comfortable for me. To resolve the issues of lack of space faced by a lot of urban-dwelling Japanese families, photographer and innovater, Yusuke Suzuki, created a ‘fold-up’ bed in the shape of a book. When the book is opened at night, it’s pages serve as a duvet and pillows and it comes with large cut out shapes and illustrations. During the day it can be folded up and used as a playmat. Kayla bought a round mattress from the 70′s and made everything else herself…(with the exception of pickle chip pillows which she received from a wonderful friend). 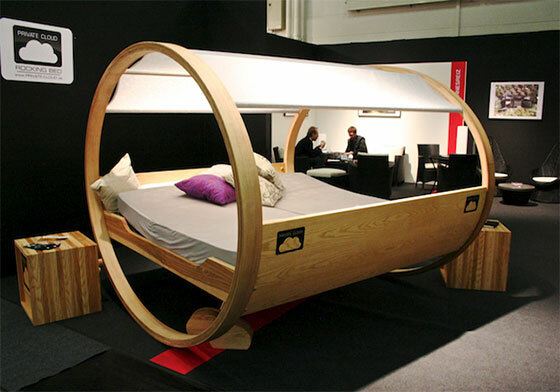 The bed is 8′ in diameter and stands about 3′ tall. In Kayla’s opinion it was the most comfortable bed she had ever owned… ever! 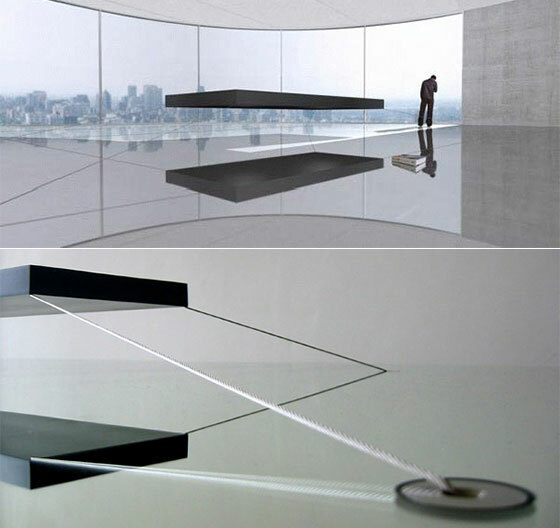 Using the power of permanent opposing industrial-strength magnets to enable it to float, the full scale bed can hold 900 kilograms of weight, while a smaller one fifth scale platform can safely hold 80 kilograms. Sosia comprises two seats that can be pushed together to form a day bed, separated into two arm chairs or wrapped in the extended cover to create a private space within a larger room. 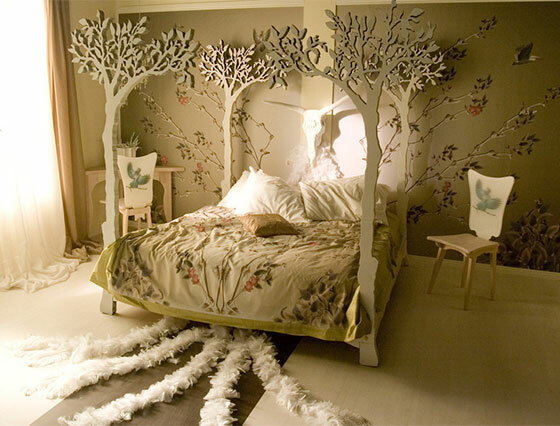 This is a contemporary unique bed by Tiina Anttila of ANtila Designs. 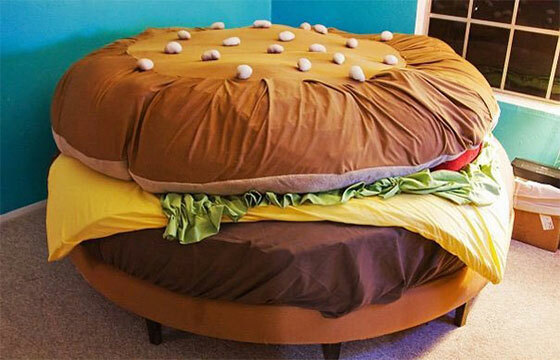 This wonderful bed is mostly handmade. If you are a nature lover wouldn’t you want to lie down on a bed and stare at trees around you as though you are lost in a forest. 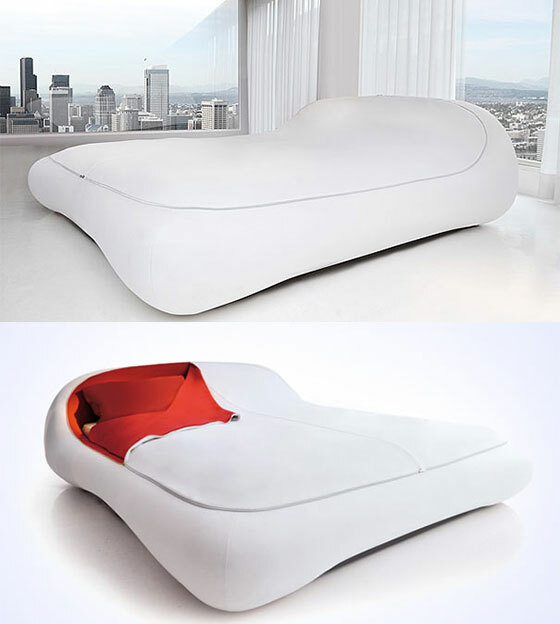 This modern bed is a queen sized bed manufactured from Ash wood. The Tree like bed posts are laser cut into Tree shape, Hand sanded and finished with a translucent white wax, that gives off sheer gloss. 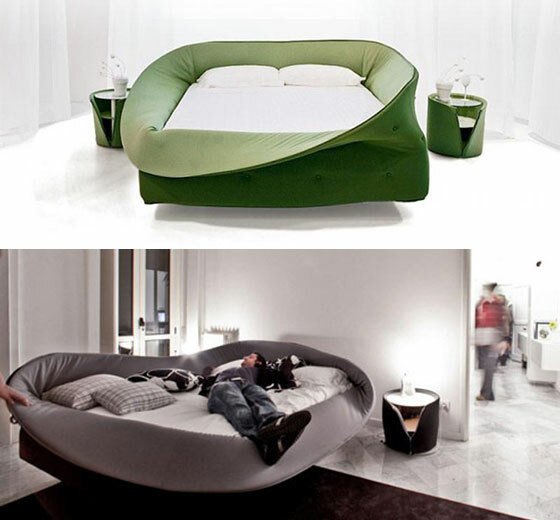 This unique bed is called the Col-Letto Bed , designed by Italian furniture manufacturer Lago. This is a bed that is very comfortable and unique ,because you can feel sleep wrapped in a visual and sound barrier that runs around the mattress. A ring of “soft foam” to relax and escape from daily routine. Hibernate offers a cocoon of your own to do this in a comfortable environment that will take care of you like in the nest. 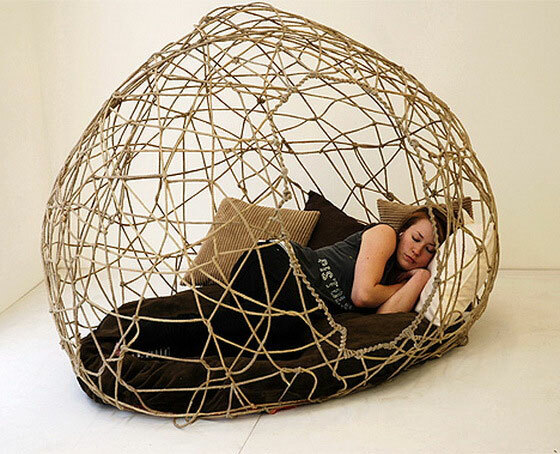 Hibernate is made of a woven strap and resin form a cocoon like a nest. Then when the rope has been formed like a nest, you add a mattress pad or foam as you lean. Try to feel. Having wrapped in hibernate you will feel comfort. You do not need to fear because of the hibernate, you can still see what’s going on around you. Czy można takie łóżka kupić, jak tak to poprosiłabym stronę. Dziękuje.